7 Night Stay in a 1 Bedroom Suite at the Wyndham Grand Desert! 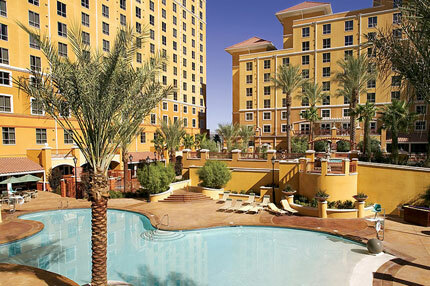 Wyndham Grand Desert - Las Vegas, Nevada - Buy a 7 Night Stay in a 1 Bedroom Suite! Enjoy 7 Nights in a 1 Bedroom Suite at the Wyndham Grand Desert in Las Vegas, Nevada! Conveniently located less than a mile from the Strip, Wyndham Grand Desert Resort offers outstanding accommodations close to the heart of Las Vegas. Pamper yourself with a dip in the hot tub, followed by a quick stop in the sauna. Spend the afternoon lounging by the magnificent outdoor pool. Kids will have a blast playing in the children’s pool, or relaxing in the Games Room. To make your stay more enjoyable, Wyndham Grand Desert Resort provides transportation to the Strip via a shuttle that runs between the resort and Harrah's Casino. Whether you want to experience world-class dining at one of its four-star restaurants, or try your luck at any of the casinos, Las Vegas has something for everyone. World-class boutiques, museums, and even thrill rides are some of the major attractions that keep millions of visitors coming back year after year. The area also boasts breathtaking natural and man-made wonders, such as Lake Mead, Hoover Dam, and Death Valley. You can also plan a longer excursion to the majestic Grand Canyon. With 787 suites in three beautiful towers, Wyndham Grand Desert almost feels like a small town itself. Every suite is comfortable, relaxing and richly decorated in an elegant Mediterranean style. Your 1 BEDROOM SUITE comes with a FULL Kitchen (coffee and tea maker, microwave, refrigerator, toaster, flatware, stove, oven and cookware) and will accommodate up to 4 people.